Update: This was real. It looks like it got abandoned more because of licensing and a standards battle than anything else. Here is a really interesting interview (pdf) done with the inventor from 1996. BECAUSE OF NEW TECHNIQUES in the field of electronics, airplane instrument panels and home television sets may soon have something in commonâ€”a rectangular picture tube less than three inches thick. The thin cathode-ray tube was invented by William Ross Aiken and developed in the Kaiser Aircraft and Electronics Corporation laboratories. 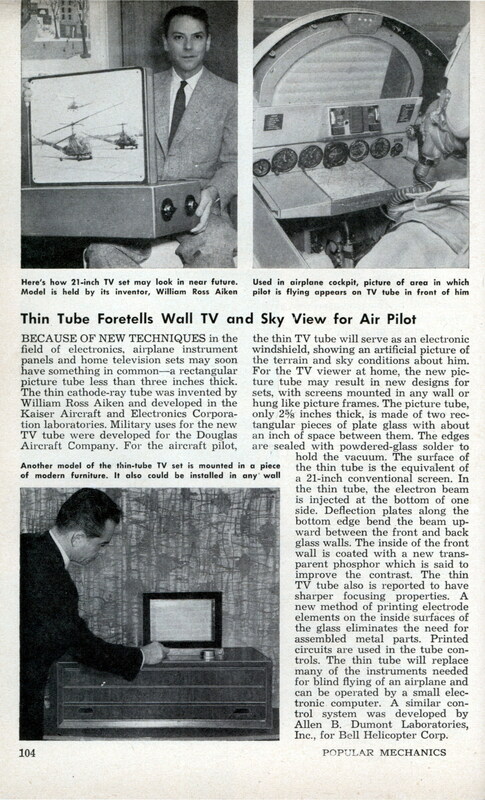 Military uses for the new TV tube were developed for the Douglas Aircraft Company. For the aircraft pilot, the thin TV tube will serve as an electronic windshield, showing an artificial picture of the terrain and sky conditions about him. For the TV viewer at home, the new picture tube may result in new designs for sets, with screens mounted in any wall or hung like picture frames. The picture tube, only 2-5/8 inches thick, is made of two rectangular pieces of plate glass with about an inch of space between them. The edges are sealed with powdered-glass solder to hold the vacuum. The surface of the thin tube is the equivalent of a 21-inch conventional screen. In the thin tube, the electron beam is injected at the bottom of one side. Deflection plates along the bottom edge bend the beam upward between the front and back glass walls. The inside of the front wall is coated with a new transparent phosphor which is said to improve the contrast. The thin TV tube also is reported to have sharper focusing properties. A new method of printing electrode elements on the inside surfaces of the glass eliminates the need for assembled metal parts. Printed circuits are used in the tube controls. The thin tube will replace many of the instruments needed for blind flying of an airplane and can be operated by a small electronic computer. A similar control system was developed by Allen B. Dumont Laboratories, Inc., for Bell Helicopter Corp.
Sinclair Radionics introduced its “Microvision TV1A pocket TV” in 1977 using the same side-scanning technology as described for the Aiken tube. 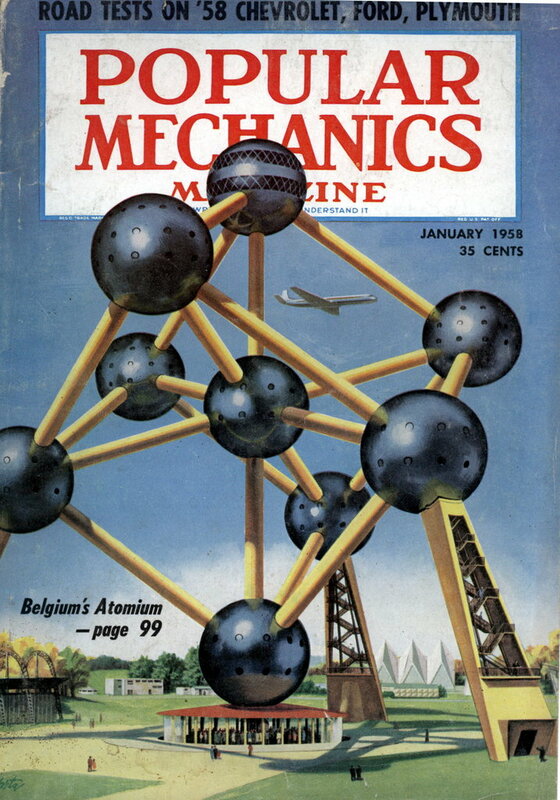 The major technical problem such designs have is severe geometric distortion, the compensation for which greatly complicated the analog scanning circuitry of the day. In fact, Sinclair claimed it had taken them over ten years to perfect that aspect of their design. These are real and they worked. The inventors Aitken and Gabor worked at Imperial College, London. The electron beam went in front of the display, and was directed onto the phosphor by charged lines under the phosphor. These lines were extended to a strip on the right of the display, so after writing a line of the image, the electron beam was then used to harge the strip, and so advance the beam to the next line. They were bright enough to be used as head-up displays in aircraft. A later development by RCA in the 1970’s added colour – red and green phosphors were on either side of a thin membrane, and the blue was a few mm underneath. The Sinclair display was closer to a Sony fat tube display of the sort you can still find used for entryphone systems. The beam went in front of the screen but it wasn’t as flat. Damn he almost changed the history of man kind.Imagine if we had a flat TV. what if he had built a 3D display system.What happened to science these days that nothing new sounds interesting.He died in February,07.I feel sad…sad as a kid who couldn’t get to see his superhero.